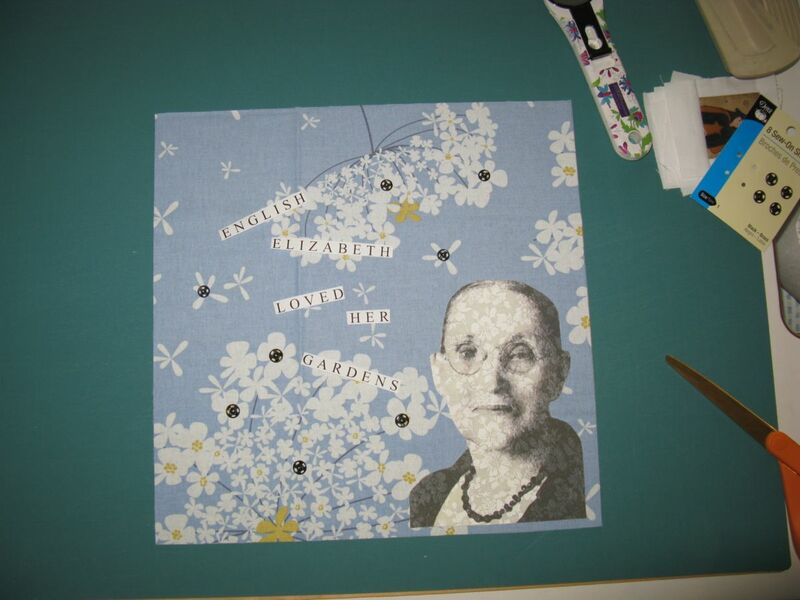 English Elizabeth’s Technical Side | OccasionalPiece--Quilt! 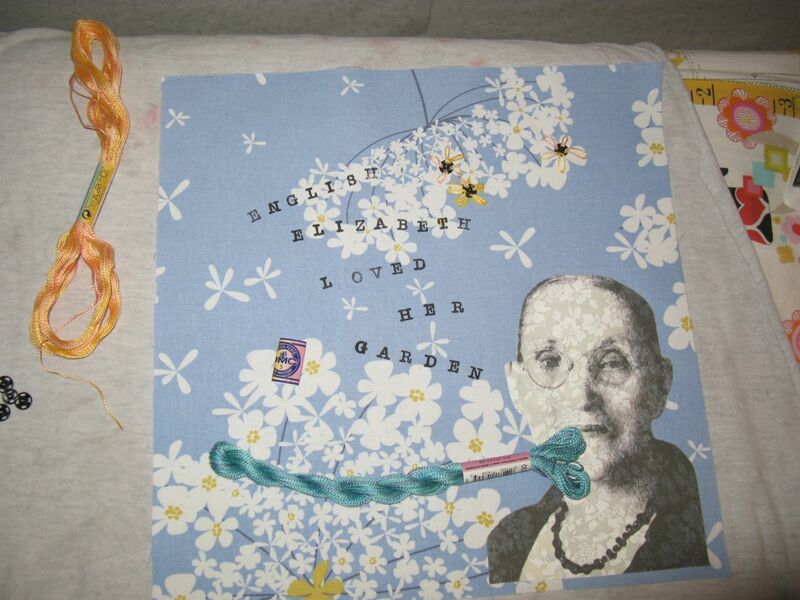 Posted on November 4, 2012 by Elizabeth E.
See the previous posts for the reveal of English Elizabeth (above), part of the Four-in-Art quilt group. One of the Twelve-by-Twelve artists (after who we are patterning our group) said she likes commercial fabrics and always uses that as a starting point for her creations. And even though I suggested this adventure of an art quilt, I was frankly a bit terrified of the whole idea, so starting with a commercial fabric seemed really appealing. The commercial fabric I’d chosen for the background was from the Madrona Road line of fabrics by Violet Craft (from Michael Miller) and it had Queen Anne’s lace in a blue and an orange colorway. I had a scrap of blue leftover from my Harvesting the Wind quilt, but it was only about 15″ square. That was it. I decided to be open to anything and while I was picking up some fusing supplies in our Jumbo Fabric Store, these black snaps jumped into my basket. Okay then, great-grandma and I are doing something with black snaps. I printed out a picture of English Elizabeth, put white papers around the edge to give a sense of the size of this thing, and arranged some black snaps marching up the sides. 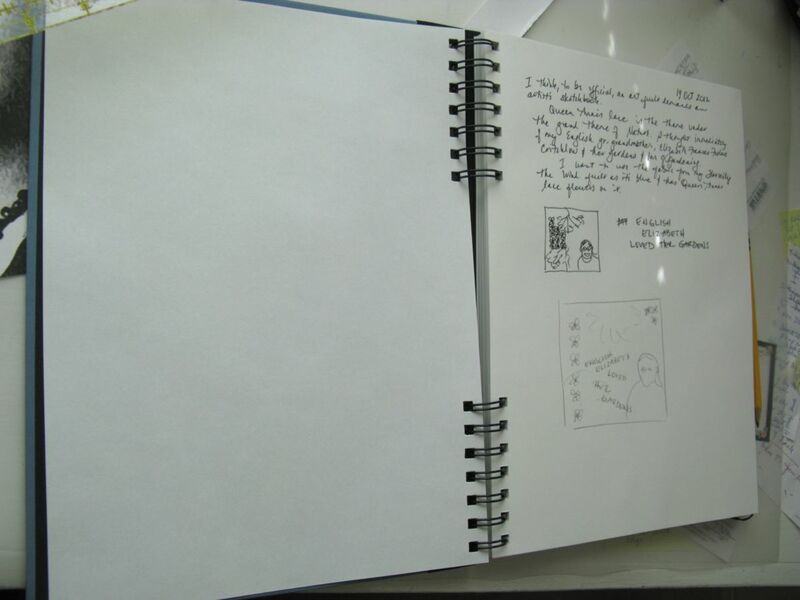 Most of the Twelves used an art journal of some kind, so I dragged out a blank one and started writing–always my fall-back mode. Then I used my (very) rudimentary art skills and sketched out some possibilities. Auditioning fabrics. 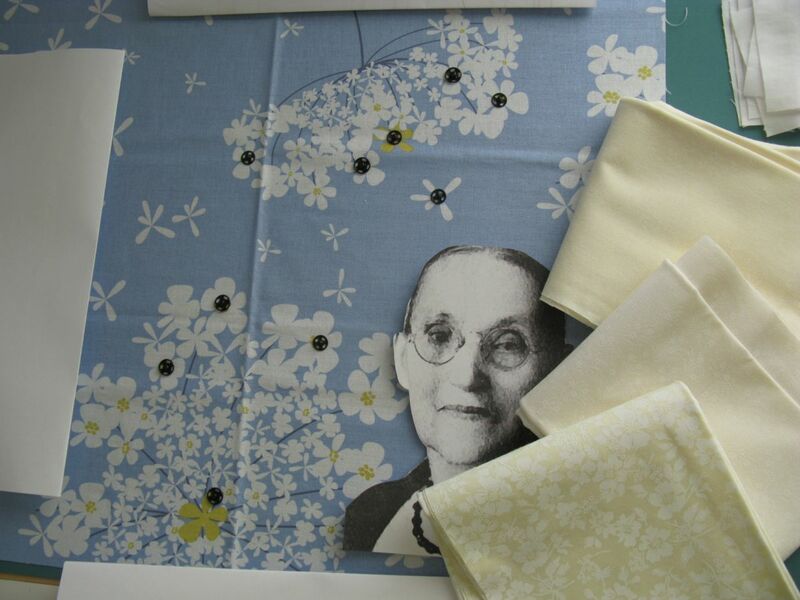 I initially thought I wanted to pick up that light mustardy hue in the fabric, but instead I was intrigued by the thought of printing Elizabeth onto some creamy floral fabric–making her into her own garden of flowers. I auditioned several sizes, like the one that was 5″ across. 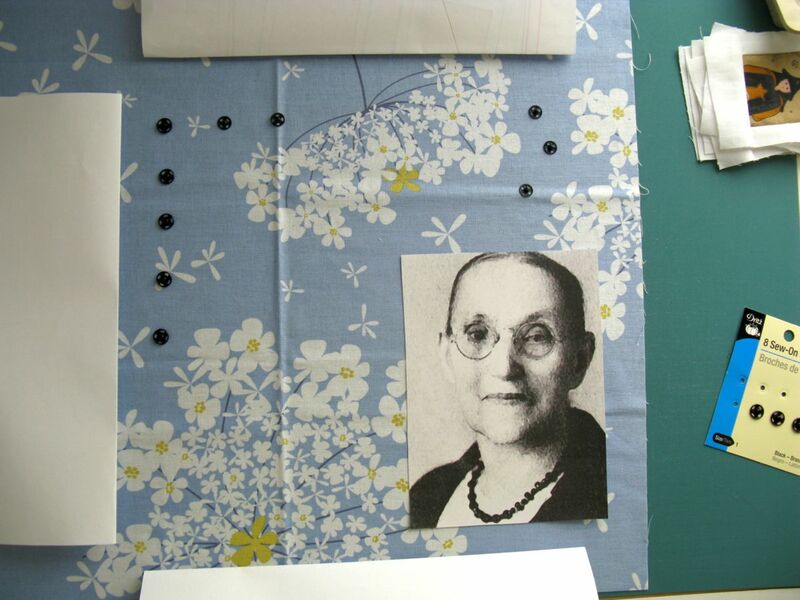 I ironed freezer paper onto a square of two creamy floral fabrics and ran them through the printer, fingers crossed. (I put tape on three sides of the stabilized fabric, leaving the bottom edge free.) It was working well! There was some trepidation every time I tried a new idea. Would the artsy part of it work? Would the technical side of it work? It was lovely having my great-grandmother look at me all afternoon. 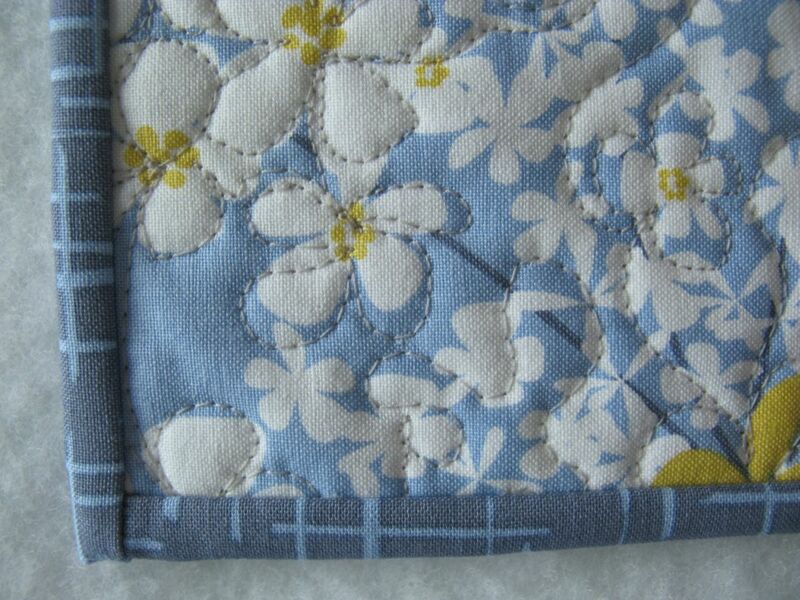 I chose the fabric sample with larger flowers, but when I laid English Elizabeth down, the blue showed through. Before I cut around her head and shoulders, I ironed some featherweight fusible interfacing onto the back of the fabric, placing the printed side against a piece of white paper, just in case the printing would transfer. It didn’t. I wanted to print this phrase I’d come up with onto my fabric, but my printer isn’t wide enough. I had a stamp set of alphabet letters, so it was back out to the Jumbo Fabric Store to buy some fabric/textile paint. That is a whole other story (did you know how many kinds of puffy paint there is??) but let’s just say I finally selected a “fabric stamp pad” by the brand name of Scribbles, and had enough time to go by the embroidery floss aisle to pick up some variegated pearl cotton for attaching those snaps. Somehow. Worried about the “heft” of the fabric, I ironed a piece of featherweight interfacing to the back of the blue, and then started stitching. Auditioning colors. I did do a couple of blossoms in the aqua-blue pearl cotton, but ended up cutting them off and going with the yellow-peach pearl cotton instead. I wasn’t crazy about the spacing in the word LOVED–that “L” seemed to hang off the edge of the word, so I converted the O to a snap-flower to even out the spaces. 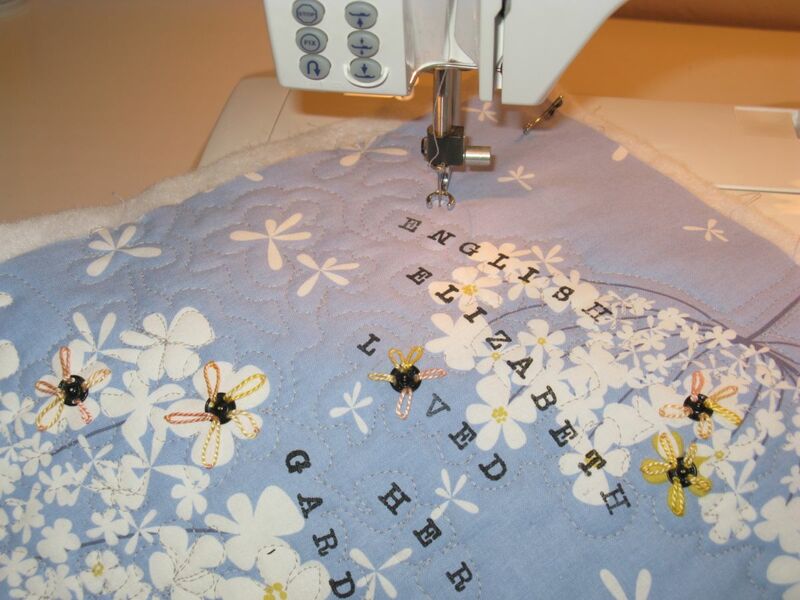 I trend to the pristine in my quilting. You know: all those points sharp and crisp, those seams perfectly joined, so to let the messy and random into the quilting was interesting. I might even say, beneficial. 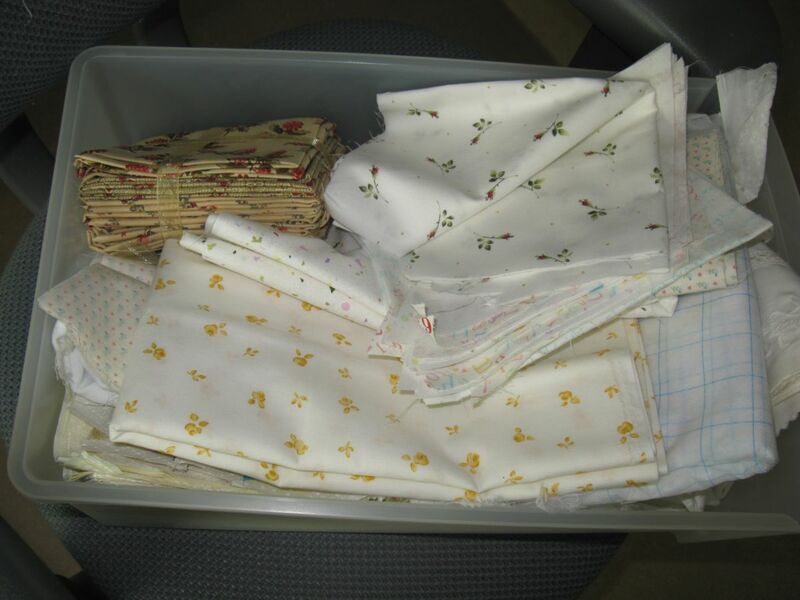 Ready to go to quilting. Usually all embellishment comes AFTER quilting, but I wanted those snap-flowers to be a part of the piece and to be able to quilt around them. 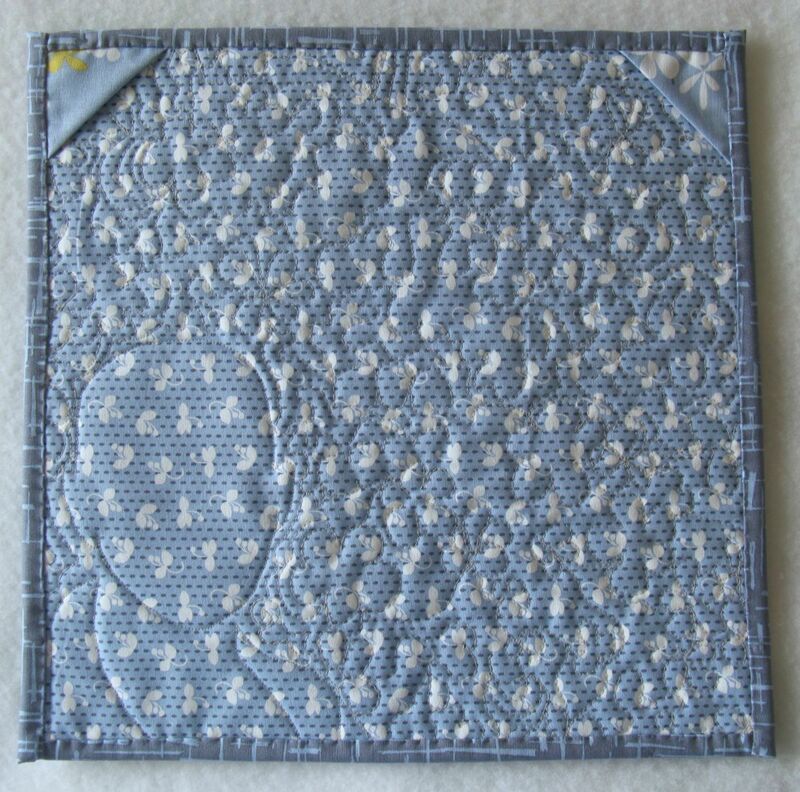 I quilted with light gray thread in both top and bobbin. 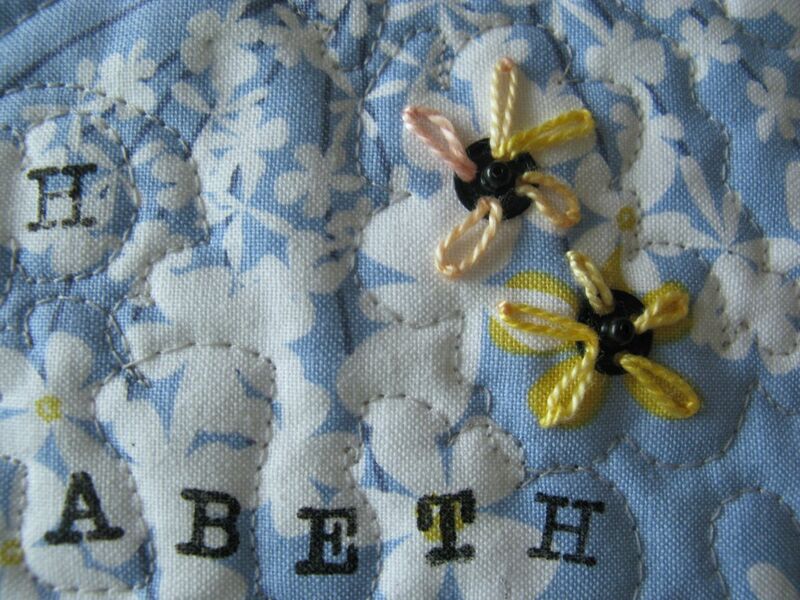 English Elizabeth, detail. 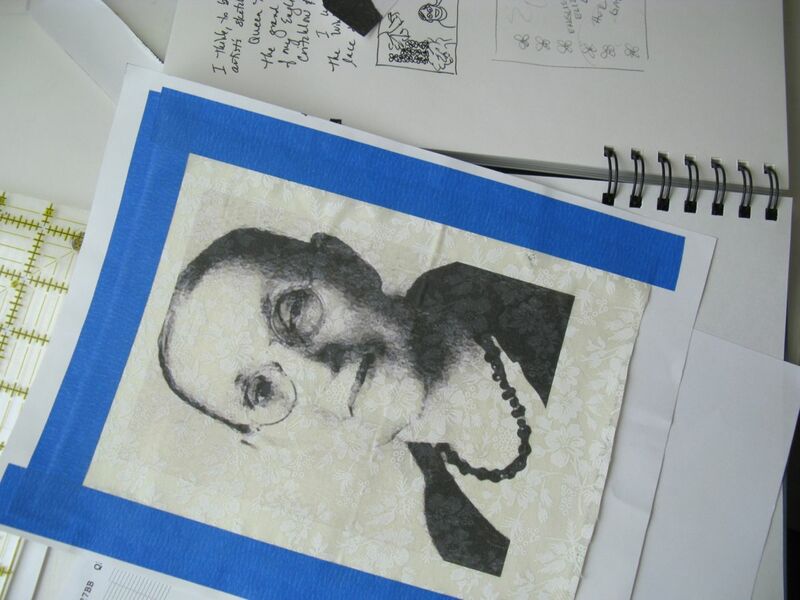 I went in with gray and cream-colored thread to outline the contours of her face and to delineate her jacket. My mother still has those beads of her grandmother’s and yes, she does wear them. I wonder when this photo was taken. It was obviously posed, and she had pulled back her hair into a tight bun. But that allowed her large eyes to dominate, along with that Mona-Lisa-like smile. The snap flowers. There are only four holes, but five petals on the individual flower of the Queen Anne’s lace stalk. So I put two petals into one hole. Sometimes they looked really funky. I bound it with a narrow straight binding, using another piece of fabric from that line, the cross-hatches suggesting a fence to me. 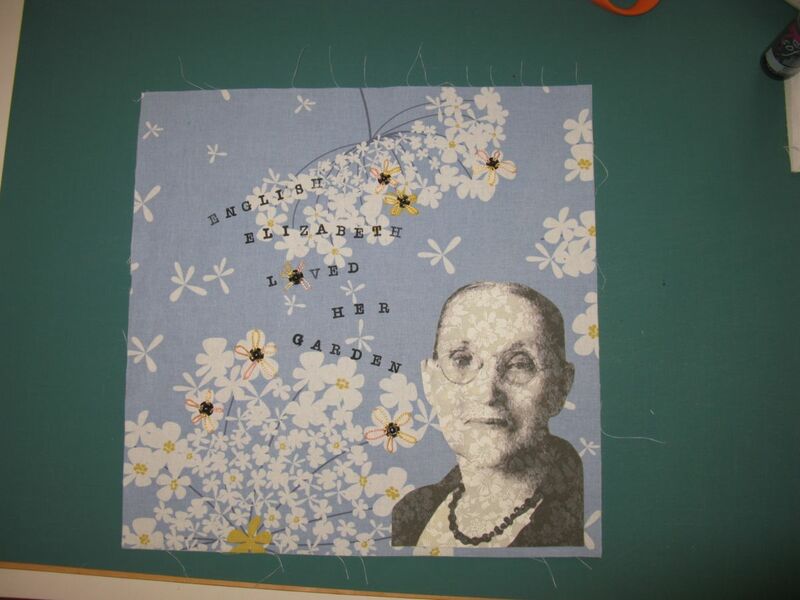 Back of the piece, showing the quilting. I used the folded corners method to hang this quilt: a dowel, cut to the length of the back of the quilt minus 1/4″ will slip into those corners, and hang on a push pin. Was making this all roses and fairy dust? No. I procrastinated beginning on this piece because the whole idea was so different. It’s like driving to the frozen yogurt shop, in a way. If you go there often enough, like my husband and I did during this long hot summer, the way there is easy, smooth and oh-so-familiar. But when we wanted to try a new shop, on a different side of the city, we had to figure out a way to get there. I did finally arrive at a satisfying place, and although the road was different and strange, sometimes frustrating and scary, I have the sweet smile of my great-grandmother looking down on me as I work, confirming that, for me, that the new path was good. Thanks for the details. The snap flowers are a great addition. I’m starting to wish I had an ink jet printer. I totally identify with the precision thing. That’s probably why mine ended up being so detailed. LOVE the snaps and the just-there floral face. What a beautiful heirloom piece! 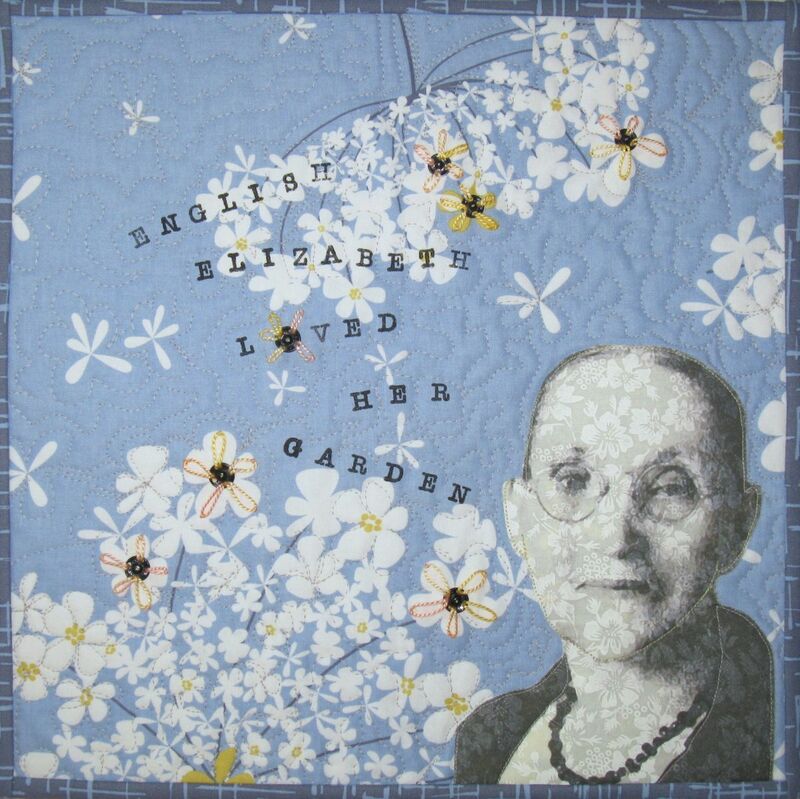 I love the idea of this quilt being made by English Elizabeth’s great-granddaughter, and then being passed down through generations to future daughter-descendants. The quilt will be a tangible link in the family chain. Wonderful description of the process and I had no idea those were snaps!!!! It took me several viewings the other day to realize English Elizabeth was actually printed on a print and I just thought “how appropriate”. You did a wonderful job with this first art quilt and in organizing our little band of artists – thank you so much! Thank you for sharing the background and process of making this quilt. I think all the details on the quilt are lovely and together they work so well together. This is beautiful! I love your creativity! Your story of the process gives this beautiful art quilt another dimension. Thank you for sharing it! I love your quilt! Wonderful to read about the entire process, Elizabeth! I felt like I was there creating with you. What a perfect little piece of family history. This is simply amazing. Amazing! Pingback: Congruence, Deconstructed | OccasionalPiece--Quilt! I answered my own question about seeing your art quilts – one was in the related group at the end of your recent post. It’s so interesting learning about your process. 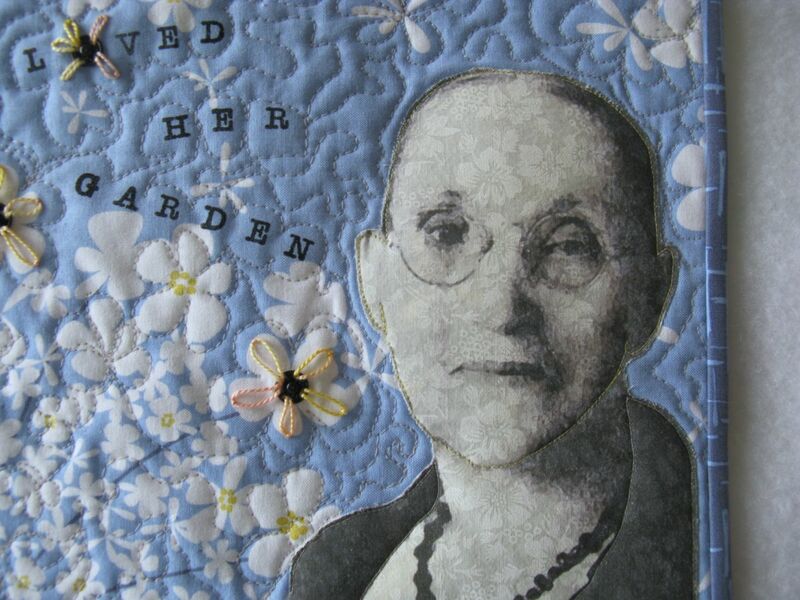 Now this is an art quilt – enter it in the Blogger’s Quilt Festival that opened today.